Here's another example of why Cartier is still one of the most sought after jewelry companies on the planet. 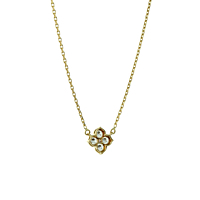 This flower necklace is made from yellow gold and has five beautiful diamonds. The timeless look and styling in the design is classic Cartier and would make a beautiful gift for that special someone in your life.